Protect Your Home with an Led Security Light & Save Money. Need to Save Money on Home Security? Welcome to the Powerbee range, easy to fit, energy efficient super bright Security Lights. Designed for the UK Including UK Winter Time!. Don't waste your hard earned money on halogen. Led lighting is JUST as effective and costs way less to run! Its the new era of lighting. Indoor & outdoor motion activated Led FloodLights, powered by solar, battery & mains. Establishing a balance of power & efficiency. PIR Sensors Detect Even Slight Movement. These led lights are all fitted with a PIR sensors. When motion is detected they automatically illuminate to shine bright light where you need it. Adjustable time, sensitivity and dusk options are available. PIR (motion sensor lights) are considered by experts to be excellent for crime prevention. An Led FloodLight is a direct alternative to costly halogen bulbs. They are much more efficient, and have a lifespan of around 50,000 hours. The battery and solar panel powered versions, do not need an electrician to fit them. They can be installed in minutes by anyone. Keep Your Home & Garden Safe with an Led PIR Floodlight. Perfect for home security lights, offices, garages, sheds, driveways, alleyways, & pathways. They are surprisingly bright, very economical and provide you with a real sense of protection. At dusk when motion is detected, the PIR (passive infra red) will automatically illuminate the Led's. Making them Ideal to light up paths, and to navigate around your garden when it is dark. They effectively deter intruders. An Led FloodLight is a Crime Prevention Light. They are designed to work all year round in the UK, making them perfect for crime prevention. Led's require far less power than halogen, but give off an equivalent light. 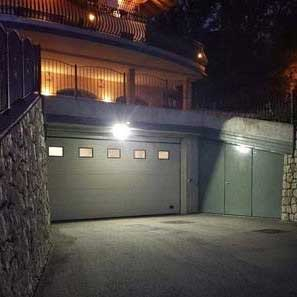 A criminal will always favour an unlit property, if you have motion activated Led Sensor Lights. The intruder understands that your property has protection. A motion sensor Led floodlight gives you peace of mind, keeping your home safe and secure. They make a a great garden security light. Proven in many studies to significantly prevent crime, PIR motion sensor Lights are environmentally friendly. They help cut your energy costs, saving you hard earned money. Each Light is at a minimum IP44 rated, so whether it's 30 degree heat or a blizzard, our outdoor led lighting is guaranteed to last for years to come. Some of our first customers have outdoor security floodlights are still going strong. We have a very large loyal customer base, who once buy from us, tell us they will never buy from anyone else again! We also offer a complete range of High Quality Solar Shed Lights.